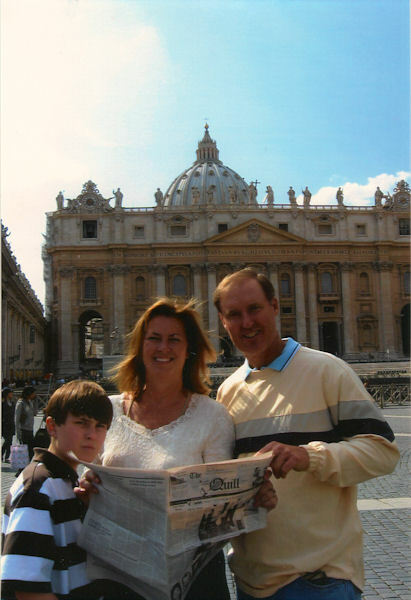 In early April, the Quill traveled with former La Harpe resident Jane (Lee) Flinn, her husband, Mike and son, Connor to Rome, Italy. They are pictured in front of St. Peter's Basilica, which is inside the walls of Vatican City. They didn't see the Pope, but saw the Coliseum, the Trevi Fountain and all of the other ancient sights of Rome. Yes, Europe is expensive. An individual pizza costs $15.00. If you order a Coca Cola at a nice sidewalk cafe, you can plan on paying $4. Coke is jokingly referred to as "American Champagne" by most waiters. They enjoyed some wonderful Italian food. While the pizza and pasta are exceptionally good, Connor stated that his Grandma Irma Lee's spaghetti was better than anything he tasted in Italy. When you travel, take The Quill along and have your picture taken with it and send it to us. Let's see where all The Quill can go.